Happy Friday! Today I am excited and honored to be joining some fabulous bloggers who share my love of farmhouse style for Farmhouse Fridays. 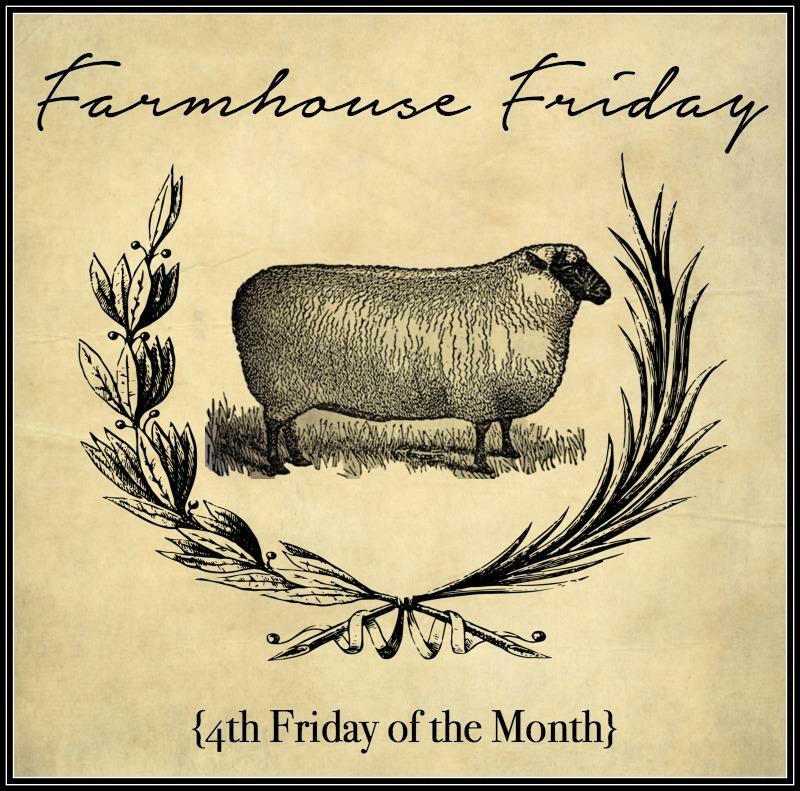 The 4th Friday of every month we will all share about a specific topic related to farmhouse decor. Today's topic is, "How to Cozy up the House - Farmhouse Style". At the end of this post, I have linked up to the other posts loaded with wonderful farmhouse style ideas to cozy up your home so be sure to check them out. 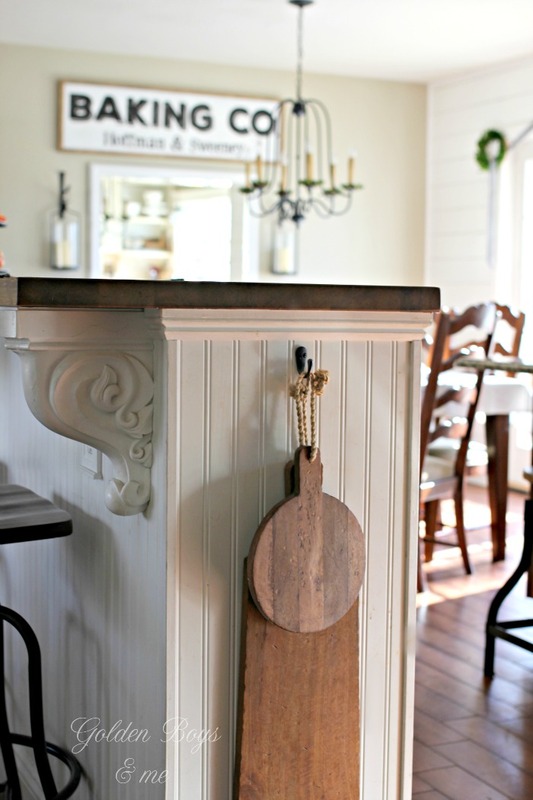 Today, I am talking about ways to cozy up your winter kitchen. This time of year, I enjoy spending lots of time cooking and baking. With the holidays behind us and cold temperatures outside, the kitchen becomes the warmest and coziest place to hang out in. In the early evening when dark settles in, I like to grab my apron, turn on some music and putter in the kitchen. 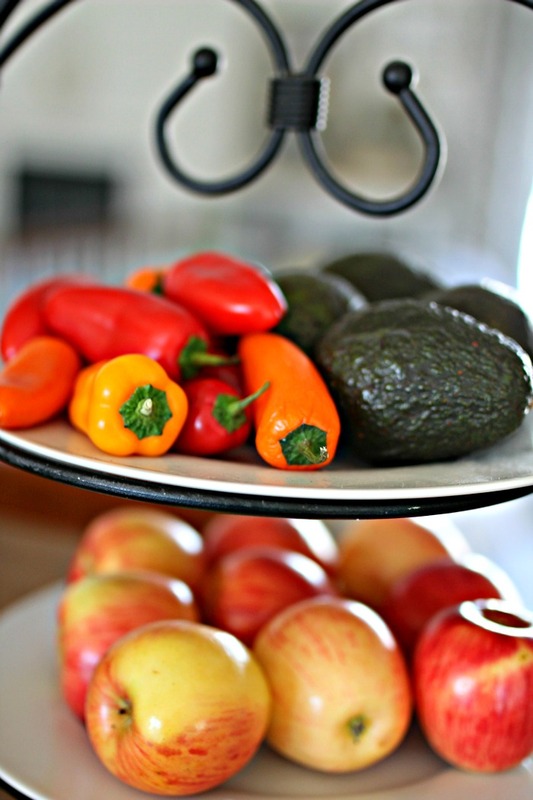 Fresh fruit and veggies feel like a necessity at this time of year after all of the rich food from the holidays. 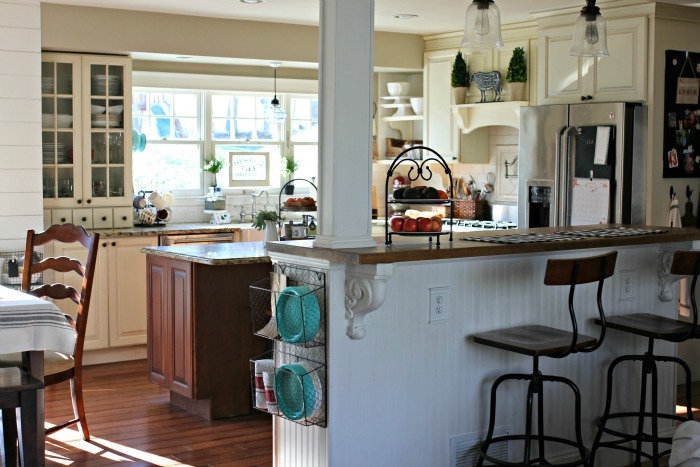 As for kitchen decor, we recently added 3 new industrial bar stools (purchased at TJ Maxx) to our kitchen island. I am pretty sure the counter stool collection in our basement is becoming a problem. :) It may even be rivaling the throw pillow collection storage problem. But I really love these stools and I think they will be staying around for a while. 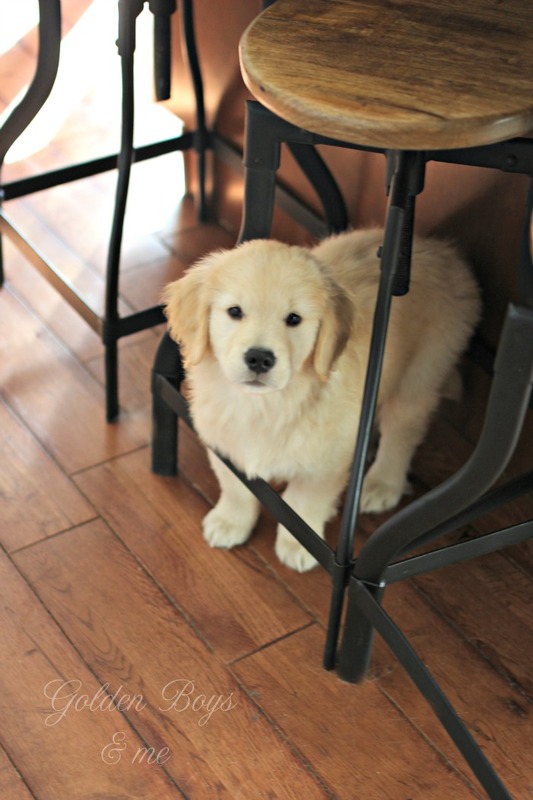 I think our sweet new puppy, Dax, is a fan of the new stools too. After the holidays, I cleaned out all of the open shelves and weeded out some of the things that were collecting dust and only kept the things we use often. I like how open shelving keeps me more accountable and forces me to keep things more organized. Here is a view of the other side of these shelves (which we created using Billy Bookshelves from Ikea). I also love to cozy up our kitchen with fun accessories. 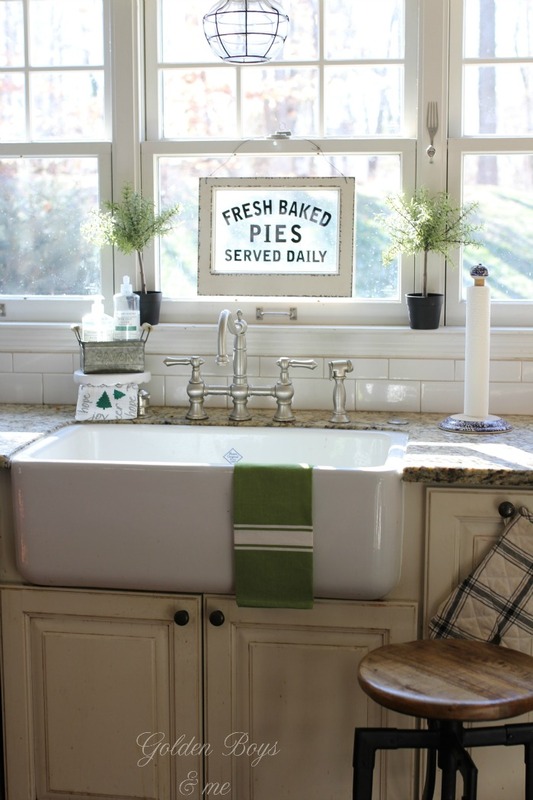 I still adore the vintage vibe the Fresh Baked Pies sign from World Market adds so I hung it back up over our sink. I picked up the green dish towels on a recent trip to Trader Joe's. I found the small white pedestal in the Target Dollar Spot and placed our soap holder on top of it. I also picked up some Winter Forest dish and hand soap at Williams Sonoma when it went on sale after Christmas. 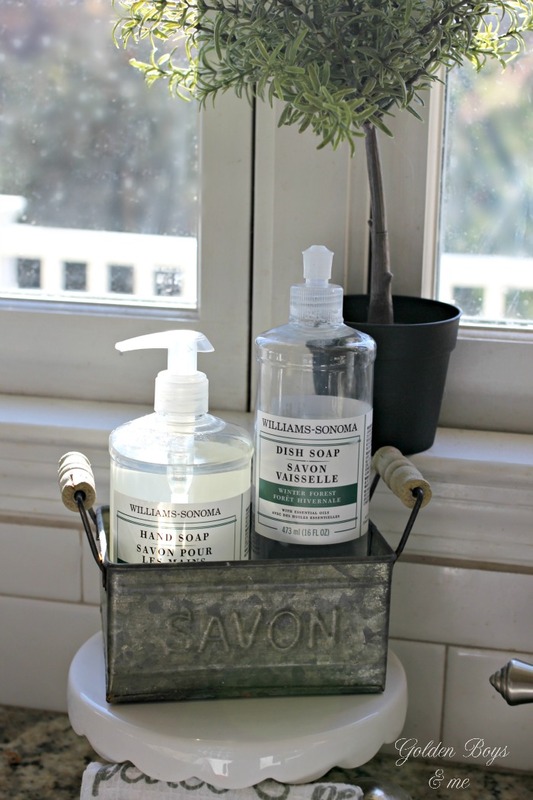 I aways get asked about the galvanized "Savon" soap holder and I had purchased it at Sur La Table, but unfortunately it is no longer available there. Good news! I found a similar one on Amazon (affiliate link). 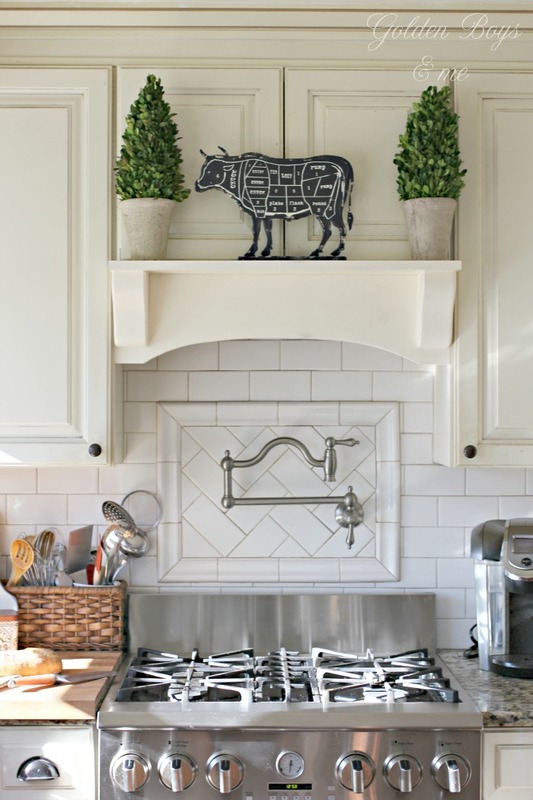 The black butcher cut tin cow on our kitchen mantel is a recent Marshalls find. It was with their clearance items and was under $10. The boxwood topiaries remain a decor staple on this mantel. I like how they balance whatever I choose to display in the middle. 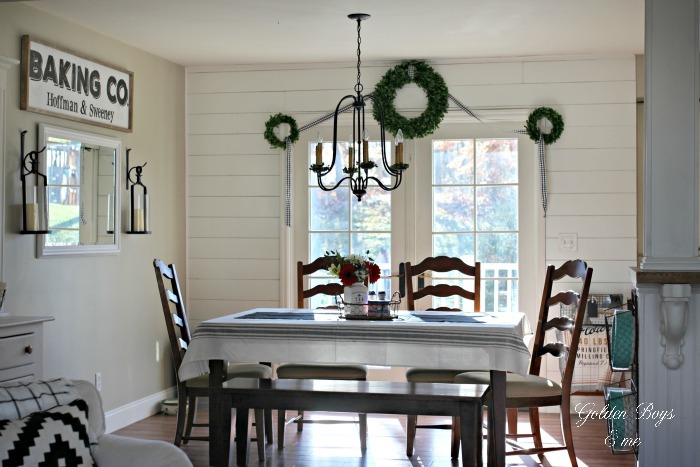 The wall planking we added to the dining area this past fall adds so much charm. I just love it! I left the boxwood wreaths up after Christmas. I wasn't ready to pack them away just yet. 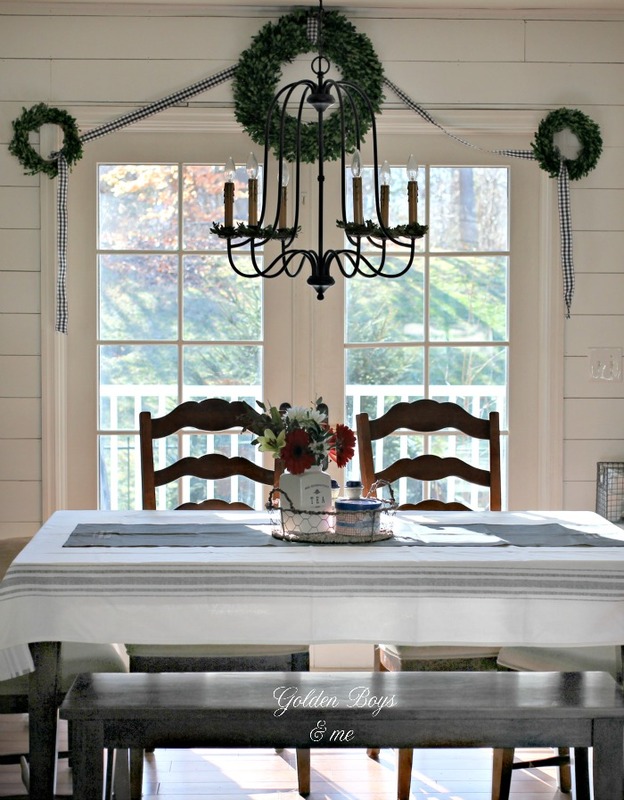 I left the small boxwood wreaths on the chandelier too. 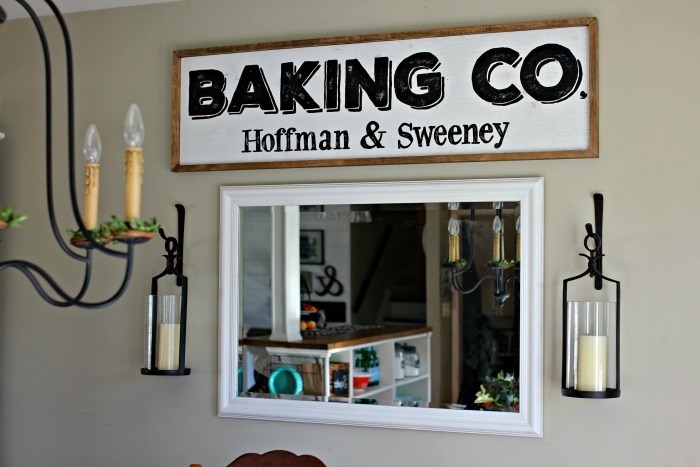 Just before the holidays, I painted this DIY Baking Company sign. It was so easy & affordable and you can find the tutorial here. Do you enjoy spending this time of year in the kitchen too? 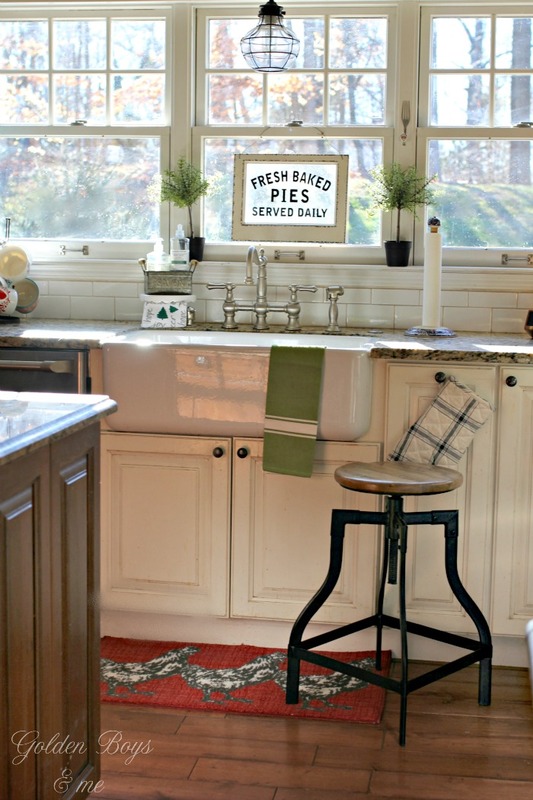 Here are a few ideas to add some cozy to your kitchen. Please be sure to check out the links to other posts on farmhouse style from some of my favorite bloggers below!! Oh my gosh Courtney I so love coming to see your house, as soon as I see the post I just have to stop what I'm doing and come see what you have shared. I love everything about your style and it makes me feel so comfortable as I know everyone else who visits your house feels tge same way. 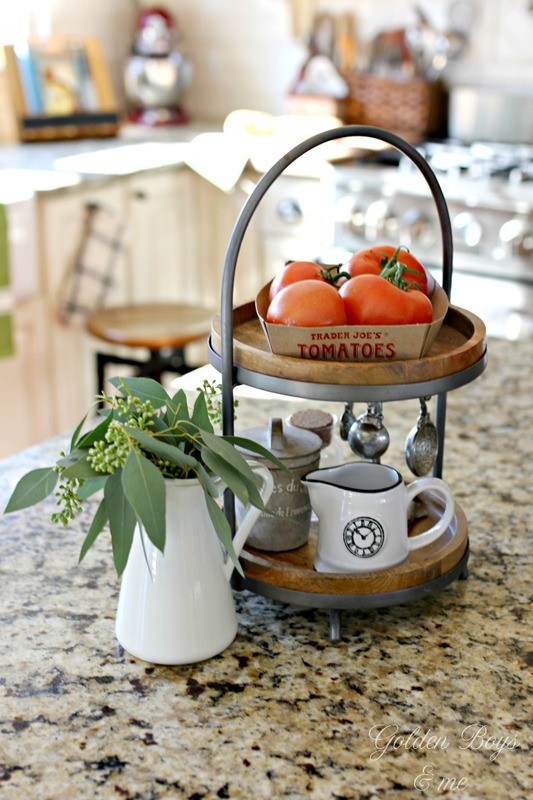 Thanks so much for sharing and letting us see your lovely farmhouse style. There's so many great ideas. Have a great weekend and enjoy your time with Dax and the boys and all your family! Thanks so much, Brooke! It is the greatest compliment to hear that my style makes you feel comfortable :) Have a great weekend! I don't know which is cuter, Dax or the Pie sign! Your kitchen is gorgeous!!! Love all of it and am so glad you're joining us on Farmhouse Fridays now! Thanks so much, Pam! And thank you all for inviting me in. I am honored to be in such talented company. Your home is absolutely charming, Courtney!! Your kitchen is to die for - those huge windows over the sink? That stove? Oh my!! I'm in love!! Oh Courtney what beautiful pics of your sweet kitchen. Love it all. Love that Dax is photo bombing too. What a cutie pie. Love this Farmhouse Fridays so much pretty inspiration and I also have found a few new bloggers I have not met yet. 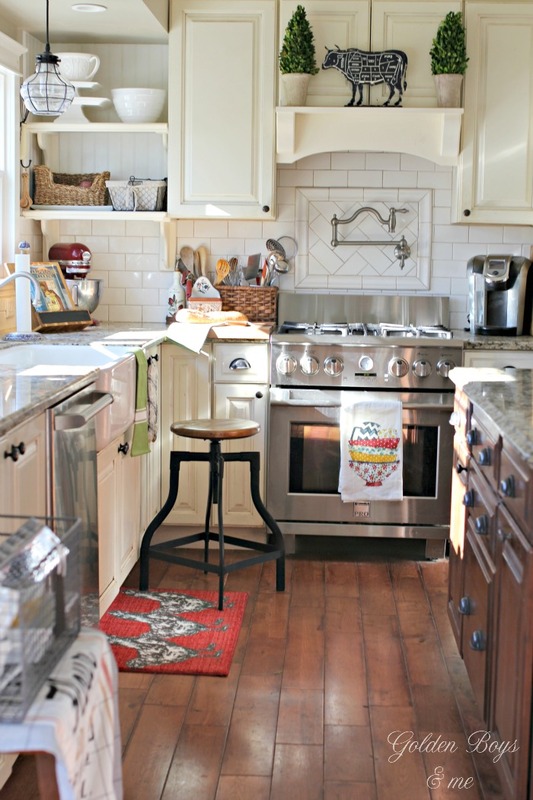 Thanks for sharing your pretty kitchen I am swooning. Happy Friday. Stay warm and cozy not sure if that blizzard is in your path. Wow that is a lot of snow to come! Oh my I love it Courtney!! This is exactly my style. I was swooning all over this. I'm inspired again. Thanks for waking me up on this cold day! I know you're in Jersey too so be safe and warm this weekend! Where did you get the adorable 2 tier dessert plate with the wood plates? I agree with Brooke I too stop everything when I see an email from you, I get so excited to see what's next and as always it's beautiful. I third that! I mark it as unread so I can find it right away and go back to it! You should be on HGTV!!!! Gorgeous! I love your home and it definitely looks cozy! Hi Courtney, your kitchen is dreamy! If we ever remodel our kitchen, I want 3 windows just like yours with the narrow ledge on which to place things. And I love that Fresh Baked Pie sign, too. Sooooooo farmhousey! 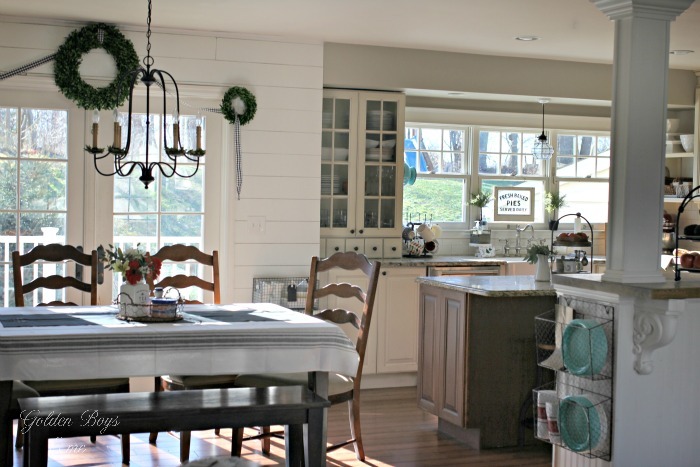 Courtney, I just love your beautiful kitchen/dining area...so inspirational...I'm pinning it all! Dax makes me want a puppy again...he is adorable! Stay warm and safe! So much inspiration in your home.. Love love love the pendant light over your sink, can you tell me where you got it? Thank you! The pendant light was a clearance find from Target a couple of years back. The brand of the light is Threshold and it started as a plug in light but my husband was able to hard wire it to use over the sink. 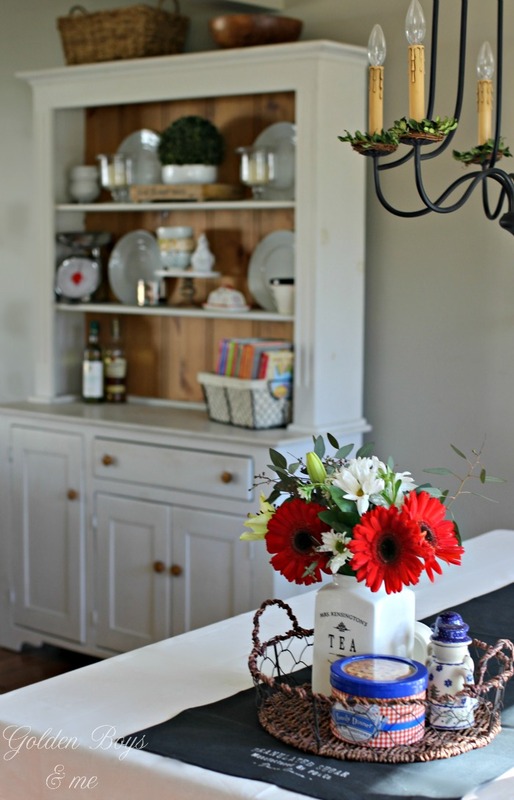 I can't say enough how much I love your kitchen--each and ever place from your appliances and farmhouse sink to the way you've decorated your shelves.. And I love your sweet little pup!!! Your kitchen is absolutely gorgeous! I can't get over how functional it is as well! So much fun being in this blog hop with you. Hi to one farmhouse girl to another! Just saw your blog!! Love it ! Hi Cindy! 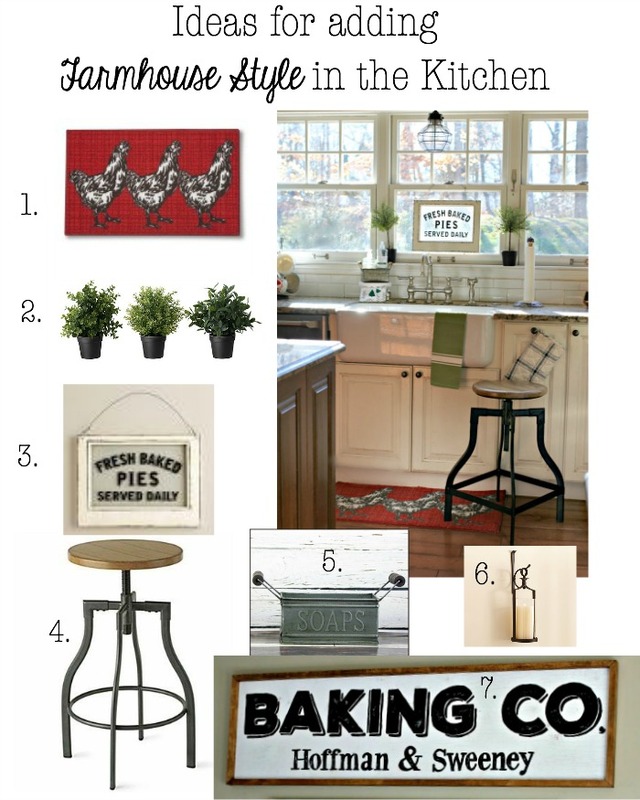 I love finding others who share my love of farmhouse style!! I just found your blog and i love it!! Your kitchen is gorgeous!!! 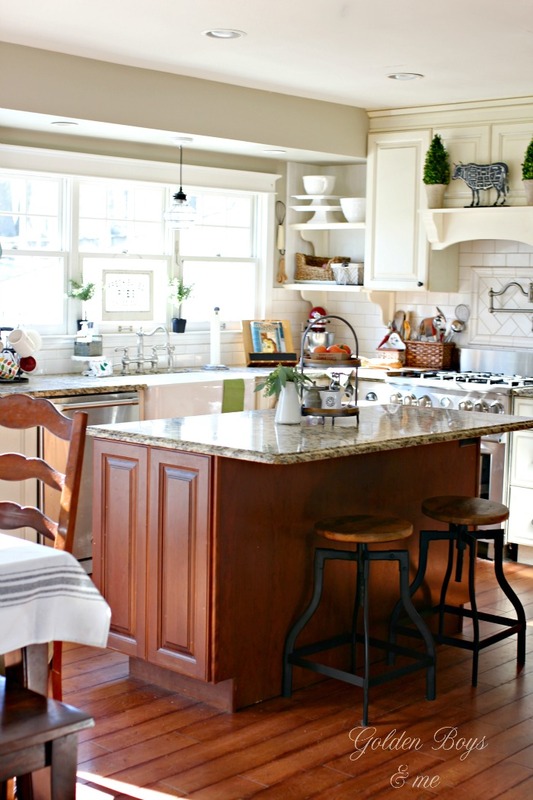 Courtney, I love your kitchen, I especially love the chicken rug, is there a link to where you bought it from? 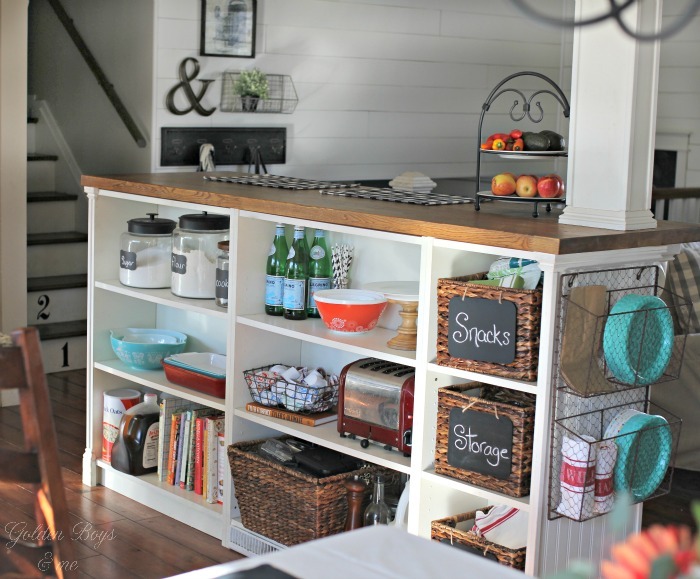 Hi Courtney, I just found you blog through Pinterest and I love your kitchen. Looks so cozy and a nice place to relax. I was wondering where you got your bar stools? Looking again I noticed that you have two different kinds. Love them both. Thanks so much for sharing your home. Oh my Courtney; you are truly gifted! I felt like I could just pull up a chair and sit down with a cup of coffee to chat. 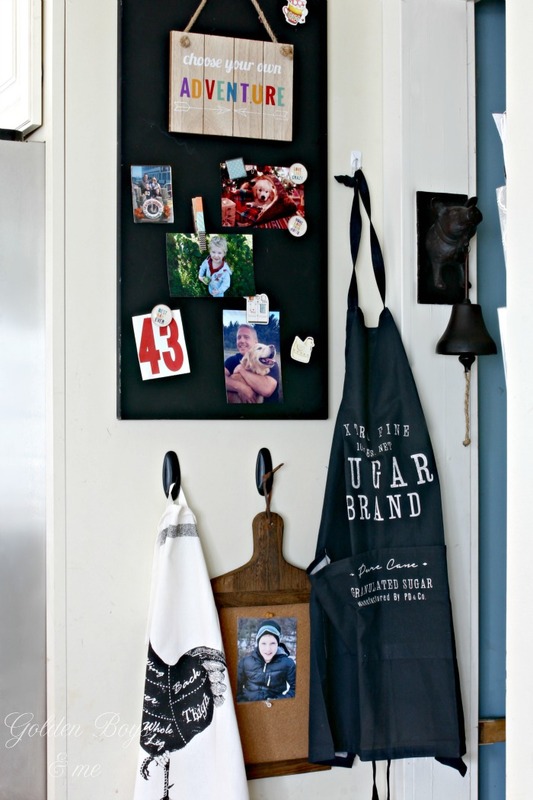 :) I love, love, love your style of decorating! My daughter-in-law is looking for barstools like the ones you have; do you mind sharing where you got those and that sweet little rug? Thanks so much for your lovely comment, Leslie! The stools are from TJ Maxx and the kitchen rug is from Target. Hope that helps.